For years the importance of maintaining a healthy pH balance was largely ignored by dietitians. However, physicians take the matter very seriously. Too much acid or acidosis can pose very dangerous health risks including but not limited to kidney failure, heart disease, liver failure, cancer and insulin deficiency. 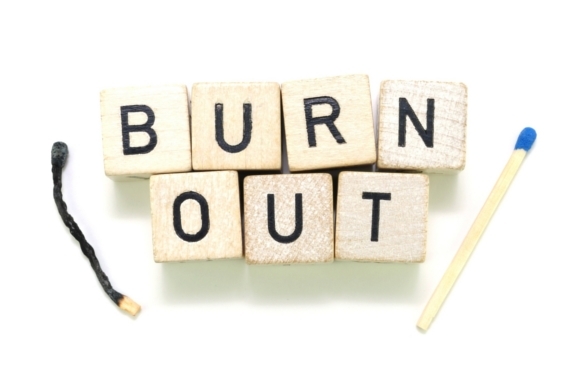 Often these conditions are attributed to other causes because the symptoms are cumulative and not immediate. Severe acidosis is comparatively rare but many people may suffer the effects of chronic low grade acidosis without knowing or understanding what it making them ill. The letters "pH" actually stand for potential of hydrogen. 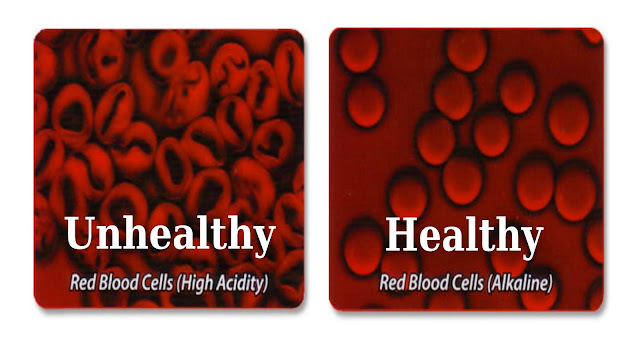 The behavior of hydrogen atoms determines whether the body is acidic or alkaline. Ideally the body's pH should be 7.0 but a slightly alkaline 7.1 is fine also. Water's pH is 7, which is considered neutral. The general rule is pH under 7 is acidic, pH over 7 is alkaline. When the body's pH is lowered, the kidneys respond with a change in metabolic activity to compensate for the acidity. Muscle tissue begins to break down producing strongly alkaline ammonia and bones release magnesium and calcium in an effort to restore proper pH balance. Over time, this constant break down of bone and muscle can lead to osteoporosis and muscle loss. People wrongly assume fruits and vegetables that are high in acid like tomatoes and oranges will produce acidity in the body. In fact, the opposite it true. 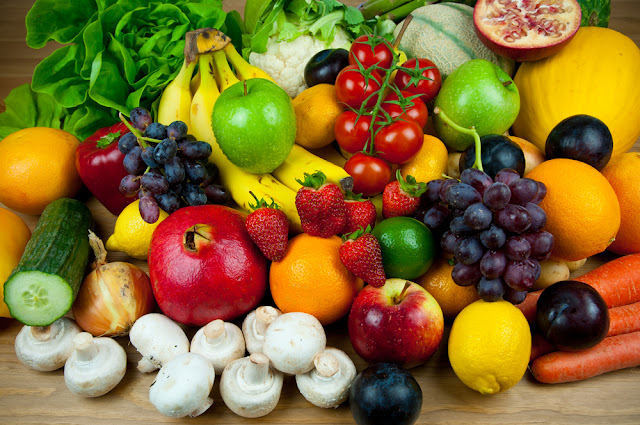 All fresh fruits and vegetables are considered alkalizing foods. They are rich in potassium and bicarbonate unlike acidic foods which are higher in sodium and chloride. Dairy products, eggs, meat (including fowl and fish), grains, nuts and sugars are acid-yielding foods. That is not to say these foods are unhealthy, of course, but only to caution that they should be eaten as part of a balanced diet that relies heavily on fruits and vegetables. About 35 percent of daily calorie intake should come from fruits and vegetables. Potassium rich foods act as a buffer against the effects of sodium rich foods in their efforts to shift the body toward a healthy neutral pH balance. Because of the overwhelming consumption of fast food, processed foods and the overall decreased intake of fruits and vegetables, the ratio of sodium to potassium in the typical diet is now three to one in favor of sodium. The diet of early man (paleolithic man) was a 10 to 1 ratio in favor of potassium. Bicarbonate, as in potassium bicarbonate is a naturally occurring compound in fruits and vegetables. Alternately, chloride is to sodium as bicarbonate is to potassium. Foods in boxes, bags, cans, packages, drive-thrus and restaurants are heavy in sodium and chloride which constrict blood vessels and increase the risks of heart attacks, strokes and Alzheimer's. In general, eating a diet high in whole, fresh fruits and vegetables should provide adequate pH balancing potassium and potassium bicarbonate. In some cases, supplementation may be beneficial but should be discussed with a health care provider. Potassium supplements come with a warning because they are not without risks. A sudden and significant increase in potassium can have repercussions for the body's electrolyte balance since potassium essentially escorts sodium out of the body. This can lead to irregular heartbeats. High potency potassium supplements are not available over the counter. Test kits are available in some health food stores and pharmacies which allow consumers to check their pH levels daily. The test strip can be touched to the tongue in the morning before any food or beverage is consumed and read instantly. If in doubt, it can never do harm to increase the amount of vegetables and fruits in the diet. The key is for each person to find the balance that works best for them and not overlook the importance of maintaining a healthy pH. Remember, diseases generally do not thrive in an alkaline environment. The humble chilli pepper has quite a reputation: from the humble jalapeño to the ferocity of the scotch bonnet there is a variety for all capsaicin hot heads. Chillis and chilli sauces have been popular for some time, many people claiming for the “endorphin rush” that eating them is thought to produce, and several varieties of different strengths and flavours have been grown. 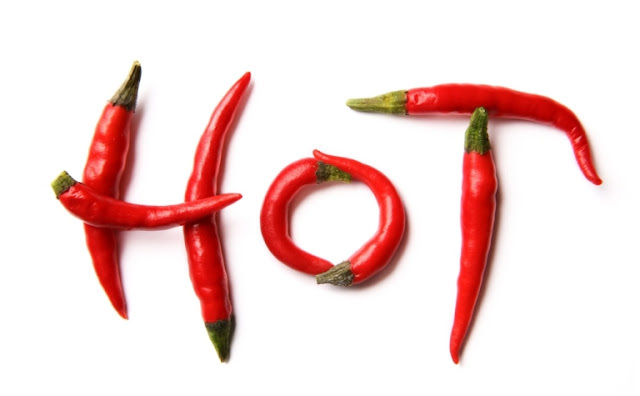 The Dorset Naga is reportedly the hottest of them all, measuring up to and over one million Scoville Heat Units, the scale used to measure pepper heat. To get an idea of scale a pimento pepper measures a paltry 100-500 units, so if you find these too hot to eat it's a safe bet that the Naga would be inedible. The chemical in chillis that give them their heat is capsaicin, a waxy compound that has very little taste or odour in its own right but interacts with a family of ion channels known as the vanilloid receptors. The major channel, known as TRPV1, is located on many sensory nerve endings and plays an important role in sensing noxious stimuli such as heat, and once activated the receptor causes the release of several neurotransmitters which signal a pain response. Interestingly the same neurotransmitters have been found to increase metabolic rate and reduce appetite, according to a study by Motter and Aherne in FEBS letters (2008). Interestingly, mice given capsaicin or other chemically similar compounds (including vanillin, a substance found in vanilla pods) eat less food and gain less weight than controls when given a high fat diet. Paradoxically however knock-out mice that have the TRPV1 receptor deleted from their DNA also have reduced food intake and body weight according to the same paper, and the authors admit that the exact mechanism of action of the receptor is unclear. One thing they are sure of though is that chronic treatment with capsaicin and other similar compounds prevent dietary weight gain, confirmed in another recent study by Reinbach et al. in Clinical Nutrition (2009). This experiment took healthy human volunteers and found that their appetites were reduced and metabolic rates increased when given capsaicin. 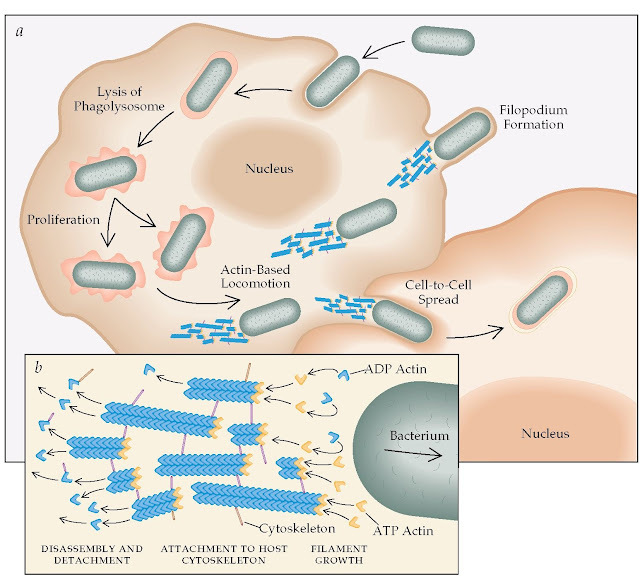 Among the proposed mechanisms of action one of the most interesting appears to be the control of a substance called calcitonin gene-related peptide (CGRP), a neurotransmitter released from sensory nerves. Motter and Aherne's study showed that precursor fat cells, preadipocytes, were sensitive to CGRP and could transform into mature fat cells when exposed to this substance, a process that appears to be inhibited by treatment of capsaicin. The authors postulated that capsaicin could help prevent age-onset obesity and insulin resistance (a pre-diabetic state), two of the biggest risk factors for heart disease, through this mechanism. Judging by the amount of interest being generated around capsaicin and the TRPV1 receptor it would appear that drug companies are paying close attention to this field of study. Certainly the limited evidence gathered so far would suggest that capsaicin and other compounds from the vanilloid family may have a role to play in obesity and diabetes. A capsaicin-like compound that could reduce body weight without the heat of a chilli pepper would possibly be an excellent aid for people trying to lose weight. However, for those that like their food spicy, there is all the more reason to put a little extra chilli in your dinner. If you're brave enough, you could always risk the Dorset Naga. Author's Note: There is no direct evidence of weight loss caused by a high chilli intake. Diet and exercise are still the best way to lose weight, but the ingestion of chilli must be exercised with caution, with no expectancy of weight loss. Chillis and high concentrations of capsaicin are certainly an irritant and excess consumption may even be harmful. 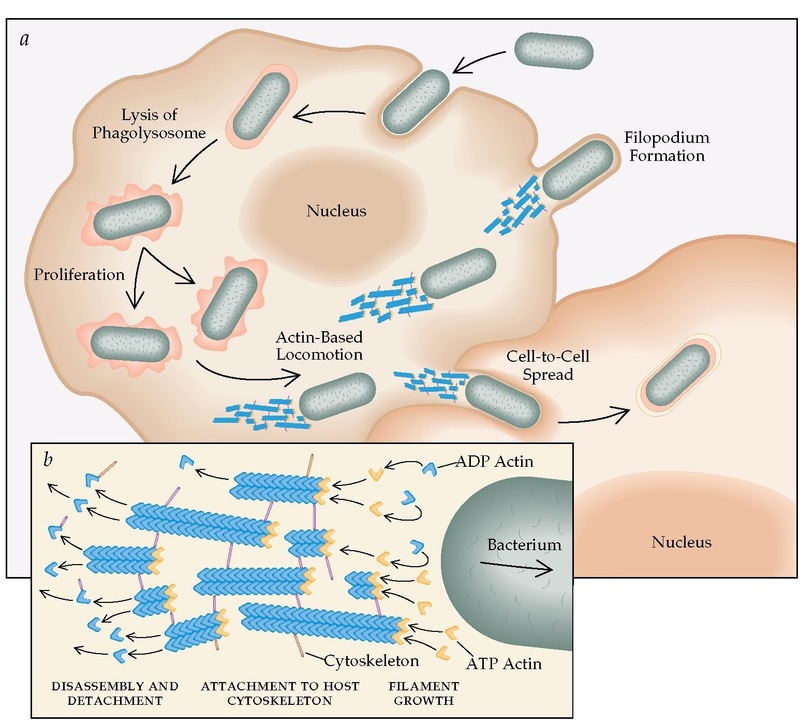 In the natural process of cell respiration – oxidation – an oxygen electron is lost and becomes a free radical, an unstable molecule that can go on to damage cells and DNA. Antioxidants disable free radicals by donating electrons. Free radicals also form due to air pollution, radiation, pesticides and smoking. Antioxidants are a broad category that includes phytochemicals, vitamins, minerals and fiber. People gain these antioxidants by eating fruits, vegetables, grains, nuts, spices and herbs – a healthy way of eating. Scientists believe antioxidants lower the risk of cancer by preventing free radicals from damaging DNA, and ease heart disease by controlling inflammation. Antioxidants support the immune system and are anti-aging. The American Institute for Cancer Research recommends consuming a wide variety of plant food, between five and nine half-cup servings per day, to keep in good physical shape. Barry Sears, Ph. D., of The Zone Diet fame, suggests eating five servings of fruit and 10 servings of vegetables per day. A big part of antioxidants is plant nutrients – phytochemicals – and they are classified in many unusual-sounding names that have come into general use. Plants use phytochemicals for self-protection, and the plant food protects humans too. Scientists know there are thousands of plant chemicals, and are in the midst of their research. Brightly colored fruit and vegetable peels are especially laden with wholesome phytochemicals. A popular phytochemical class is the carotenoids, which are further broken down into now-familiar-sounding nutrients like beta-carotene (for example, carrots and broccoli), lycopene (tomatoes and watermelon) and lutein (kiwi and romaine lettuce). Another large family is the flavonoids, which include the anthocyanidins (berries and plums), flavanones (citrus fruit), and quercetins (apples and red onions). Then there are the cruciferous vegetables containing sulforaphane (cabbage and cauliflower) and indole (Brussels sprouts and broccoli). Actually, most fruits and vegetables are composed of hundreds of nutrients; for example, some of the known ingredients in red grapes are resveratrol, quercetin, and ellagic acid, while popular nutrients in kale include beta-carotene, lutein, quercetin, sulforaphane and indole. The National Institute on Aging, an arm of the United States National Institutes of Health, developed a measurement system for comparing antioxidant capacity in nutrients. The unit of measurement is called the Oxygen Radical Absorbance Capacity (ORAC). It turns out that small amounts of herbs and spices are more heavily packed with antioxidants than larger amounts of fruits and vegetables. For example, just one teaspoon of ground cinnamon scores a 6956 on the ORAC scale, whereas a comparatively large half cup of broccoli rates a 620. Number 17 on the USDA list is the common, humble and cheap russet potato. It was developed over 100 years ago and if grown in Idaho, USA, is called the Idaho potato. Besides rated highly for antioxidants, the lowly russet is nutritious. Nutritiondata.com analyzed a large, cooked potato that had seven grams of fiber, eight grams of protein, minimal salt and sugar and no sat or trans fats. Although it had 290 calories, it was high in vitamin C. The trick is not to spoil this wholesome food with unhealthy condiments. Workout programs can be great for a person's health and body, but they can also cause damage if they are done incorrectly. There are machines at the gym the can damage joints and muscles, and these machines should not be used by the average person during workout programs. Avoid using the seated rotation machine during a fitness routine. 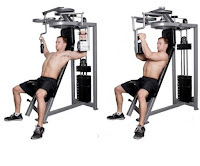 This machine puts a lot of stress on the back and does nothing to reduce love handles, it can be a waste of time to include this in a fitness routine. The seated rotation machine will work the muscles in the sides of the lower stomach, but there is a popular misconception that this machine will help get rid of love handles and it will not. If someone wants to get rid of their love handles they need to do a cardiovascular workout such as the stair climber so that they burn more calories, which is the only way for a person to lose weight. The seated leg extension machine puts a lot of stress on a person's knees, and as someone ages it can create problems in their knees, do not make this a part of a fitness routine. Instead of using this machine do squats with free weights, performing these exercises will give the same benefits to the body without the potential damage to the knees. This is especially true for older people who are working out, as people age the knees are not as strong as they used to be an are more susceptible to injury. Do not use the chest fly machine during gym workouts. 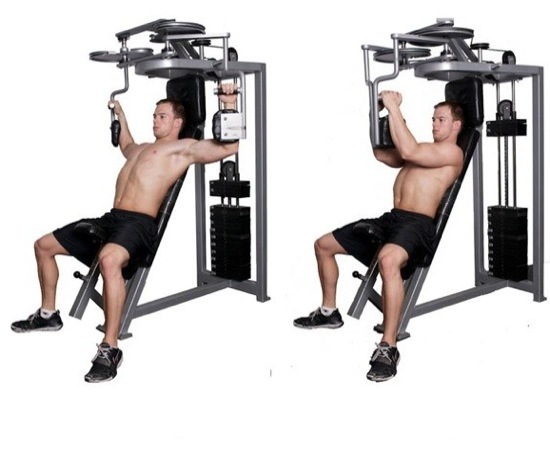 The chest fly machine can be very hard on a person's shoulders and can cause serious damage. Instead of using the chest fly machine do push ups instead. Push ups work many of the same muscles without the strain to the shoulders and are a helpful part of any fitness routine. There are many push up systems on the market today that isolate and challenge the muscles more than traditional push ups, these are an excellent choice for getting a great upper body workout and reducing the potential for injury. 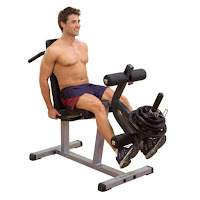 By avoiding the seated rotation machine, the seated leg extension machine, and the chest fly machine people can reduce the risk of injury during their workout programs. There is always several options for working out a set of muscles. A personal trainer or fitness professional can educate people on the safest methods to work out a particular muscle group at the gym. Disclaimer: The information contained in this article is for educational purposes only and should not be used for diagnosis or to guide a fitness routine without the opinion of a health professional. Any reader who is concerned about his or her health should contact a doctor for advice. A listeriosis infection is caused by consuming contaminated foods that contain a bacteria labeled as listeria monocytogenes. Listeriosis symptoms can in some cases become dangerous and even sometimes life-threatening. According to the U.S. Centers for Disease Control and Prevention, listeriosis infections have become a major health care issue in the United States. In order to prevent this bacterial disease, it’s essential that awareness is raised and individuals understand what causes a listeriosis infection. The bacteria known as L. monocytogenes is commonly carried through wild or domestic animals, water and soil. Additionally, the bacteria can spread to meats and vegetables, as the soil and water which contains this bacteria can easily transfer to these types of foods. For those who consume these contaminated foods, it is likely that they may become ill. Pregnant women are at an increased risk, as the listeriosis infection is more likely to attack the health of women who are pregnant due to their immune systems being weakened. This can also be dangerous for the unborn child as well, as the disease can sometimes pass through to the baby. In most cases, this type of listeriosis bacterial infection causes individuals to become sick with a gastrointestinal illness. However, in some cases, individuals may also develop an infection in the blood (referred to as septicemia). Additionally, in even more serious cases, individuals can also develop inflammation around the brain, which leads to meningitis. Overall, in order to reduce the risk of getting listeriosis, individuals must be extra careful about handling and consuming raw foods. It’s essential that people cook their pork, beef and poultry thoroughly. It’s also best that individuals make sure they wash their vegetables very well, before serving or eating them. People should be sure to use a good antibacterial soap to wash their knives, plates and all utensils used to cook and prepare foods. Lastly, individuals should always wash their hands immediately after each time they touch these types of foods or anything possibly contaminated. There have been recurring outbreaks of listeriosis infections throughout the United States. In order to reduce the risk of getting listeriosis, individuals should consider the sources that carry this dangerous bacteria and always be extra safe when handling any foods that have a chance of being contaminated. This diabetic food pyramid functions in a similar way to the regular food pyramid. One of the main differences is that the diabetic food pyramid focuses on limiting sugar intake. Diabetes is a disease that prohibits people from eating sugar at the same levels that they used to. This does not mean that all diabetics have to avoid sugar like vampires avoid the sun! Some people have mild cases that enable them to eat sugar once in a while. Others have to avoid it at all costs. 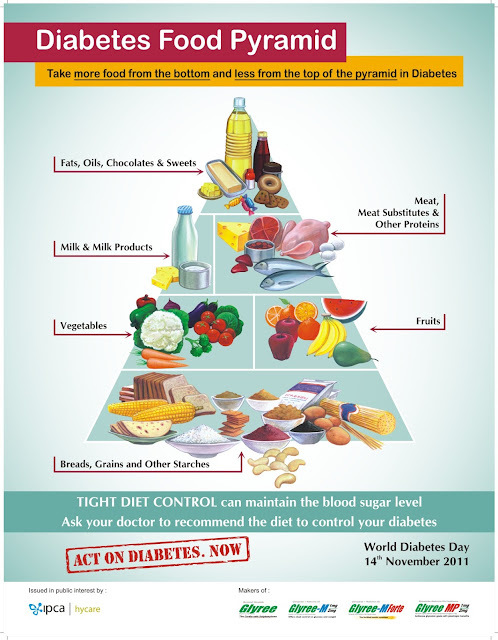 The diabetic food pyramid is a lifesaver to many people. Just by looking at the pyramid they can tell which foods to eat and which ones not to. It also suggests serving sizes and suggestions for planning whole meals. The diabetic food pyramid has six categories of food groups. At the bottom the main group is grains, starchy vegetables, and beans. The second grouping on the diabetic food pyramid includes vegetables and fruits. The third includes diary products, meats and other sources of protein. At the top the list of fats, oils, and sweets should be consumed least of all. The latest version of the diabetic food pyramid was rolled out by the United States Department of Agriculture in 2005. Not only does it describe what to eat, but it also makes recommendations on calorie intake! If you want to find out more about the diabetic food pyramid you should begin your search with the diabetic organizations that serve people with diabetes. There is so much information floating around about diabetes and nutrition that in only a short time you should become somewhat of an expert on the subject. Remember, the pyramid might not be as exciting as the one at Giza in Egypt, but it’s still something to marvel at. Good luck and happy eating!